What a great day we had hosting our Community Connections! Upcoming Show Palace Event in Hudson! Come see the "Rat Pack Lounge" in May, 2019! 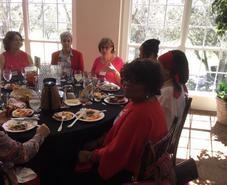 Sugarmill Woods Country Club with membership specials. 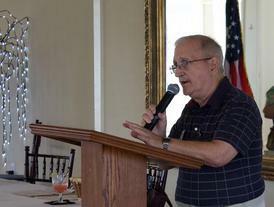 Citrus County Blessings is one of the special charities we support! 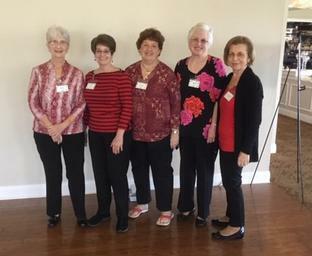 Our "Sister's at The Women of Sugarmill Woods Womens Club! 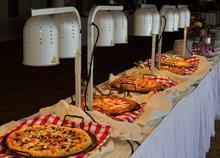 An Array of Fresh Pizzas! Speaker Robin King with the National Alliance on Mental Health gave us an informative speech about the organization and their many services available. ...and of course we celebrated our October Birthdays!! 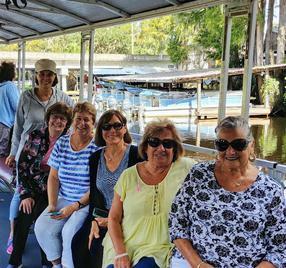 Our ladies enjoyed a fabulous Day Trip on the "Singing River Cruise and lunch! 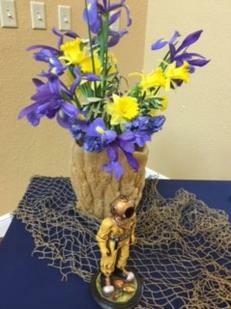 We enjoyed our Annual Craft Show! 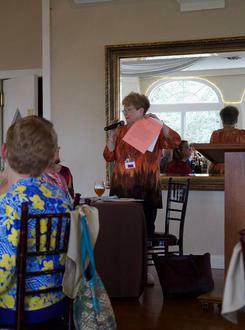 Marj announces upcoming activities, craft sale vendors, and the many raffle baskets that were made by Ginny and Eva! 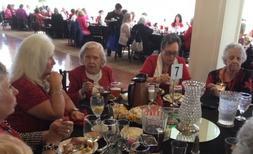 Cindy discusses upcoming Empty Bowls & Muddy Fingers events. Ginny and Eva run the raffle ticket table! We enjoyed a nice lunch! The ladies made over 30 baskets with proceeds donated to Jessie's Place and the Panhandle Hurricane Relief. 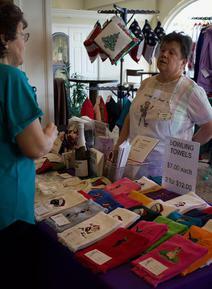 Diane Frueh of "DF Stuff & Such" displays her embroidery crafts. Gail Wilbur sells her line of "Granny Gail Mason Jar Candles"
Joy Sawaya presents her homemade Christmas items. Marian has beautiful hand knitted clothing...many are perfect gifts for new parents! Rusty shows her handcrafted jewelry! Shelley has a gorgeous collection of hand embroidered towels! 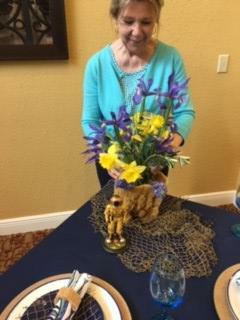 Barbara looks over Penny Wright's table of crafts! Carol and Marj present the check to Jessie's Place! Weeki Wachee High School Chorus Performs! Packing Food for Citrus Blessings! What a great journey through Napa!!! 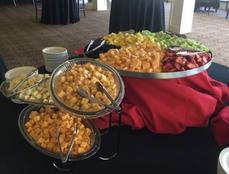 It was a great food and wine paring! Adrienne presented a variety of wines that pared with our meal. Our Guest Speaker, Sarah from "Paint the Town Citrus"
Sarah from "Paint the Town Citrus" talks about 3 paintings that were done by our very own OVWC women! What a spectacular Valentine's Day! 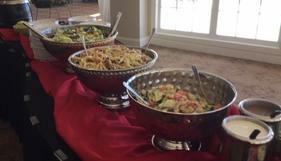 ...and what a fabulous buffet! 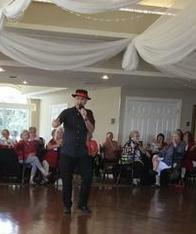 ...Followed by our own local entertainer, "AL CHANCE"! 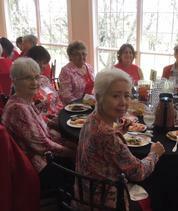 Our ladies enjoy a day at "Paint the Town"! 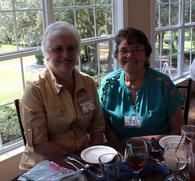 We enjoyed socializing and our meal! Sally give us an Irish Blessing! 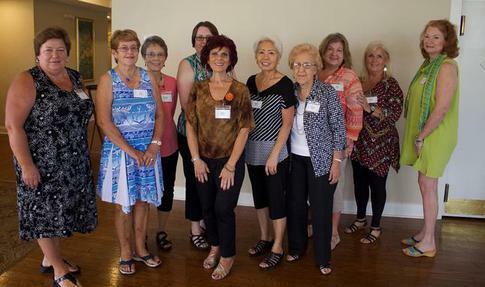 Meet the "Classic Country Kloggers!" April 2019 ~~~ It's BINGO Time! 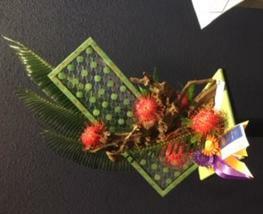 Our own ladies presented their beautiful flowers at the Homosassa River Garden Club competition! 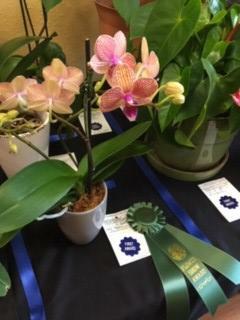 Patti Steck won "Best in Show"
Dee Green won a blue ribbon! 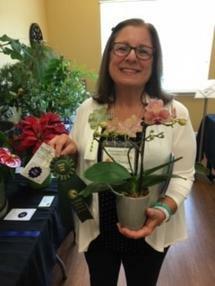 Gloria Anderson won a ribbon in "Horticulture" for her orchid! 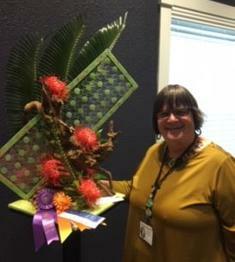 Nancy Smith won "Line as element of design"! 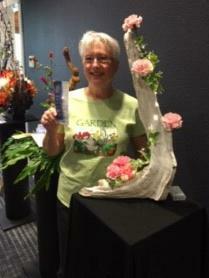 Elaine Parisi displays a "Tarpen Springs themed table setting! Some of our ladies enjoyed making colorful silk scarves at Cindi's! We gave out a special gift this year to all members~~~~a certificate toward two of our local craft shops, "Pepper Creek Pottery" and "The Glass Garage" in old Homosassa! Marj and Carol with the owners of the "The Glass Garage"
Marj and Carol with the owners of "Pepper Creek Pottery"
Carol Housteau and Rosemarie Lester hand out the certificates! Ginny & Eva hand out 50/50 raffle tickets! Let's get ready for BINGO! Hattie Ciolko and Linda Cardineli hand out BINGO sheets! We have alot of announcements! Janis Stacey tells us about a Rotary Club sponsored fashion show on June 3rd. See under our "Announcements" tab. Rose talks about the upcoming May 2nd "Rat Pack Lounge" event in Hudson. 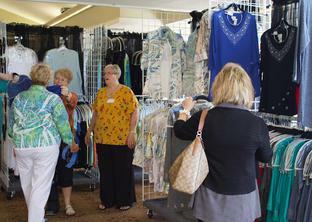 Becky tells us about the Women of Sugarmill Woods fashion show coming in November! Mark your calendars for 11/16 and more information to come! 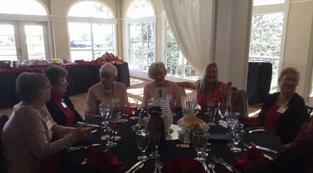 Marj Balogh and Linda Cardineli have a silly time calling out numbers! We think they were bored after awhile LOL! Now girls, give me a big smile!!! !